OTTAWA — The drama that is the NHL’s Ottawa Senators will add another chapter when Erik Karlsson makes his anticipated return to Canadian Tire Centre. Karlsson, the former face of the Senators franchise, was dealt to the San Jose Sharks just before training camps opened this season, capping what had been a messy period between the team and the all-star defenceman. The Sharks are in Ottawa for a game Saturday night. “I don’t really know what to expect to be honest with you,” Karlsson said Friday. “I think it’s going to be a little bit emotional. How it’s going to play out I’m not really sure. I haven’t really tried to overthink it too much. Karlsson’s trade came after the team plummeted from a Stanley Cup contender to an NHL minnow in just one season, enduring a string of controversies along the way. His future was in Ottawa was in doubt when Senators owner Eugene Melnyk issued a since-rescinded threat last December that he might move the franchise if ticket sales didn’t improve. 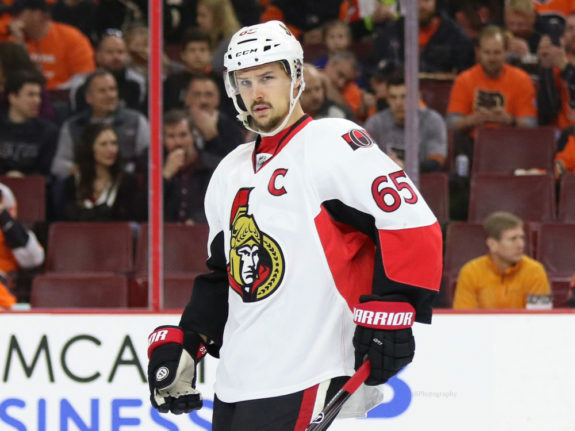 Rumours circulated at the time that Karlsson would be dealt by February’s trade deadline. The Ottawa captain wound up staying put for the time being, but tragedy struck in March when Karlsson and his wife Melinda announced their first child, a son they named Axel, was stillborn. After the club’s miserable season finally came to an end, Karlsson’s wife accused the fiancee of then-teammate Mike Hoffman of cyberbullying. Hoffman was traded a couple of weeks before Karlsson was dealt. Despite a messy exit, Karlsson said he had no regrets about his time in the nation’s capital. Before the Senators fell on hard times, things were good for Karlsson in Ottawa. He became a superstar with the Sens, registering 126 goals and 392 assists for 518 points in 627 regular-season games and 37 points in 48 playoff contests. He won the Norris Trophy as the NHL’s top defenceman in 2012 and 2015 and led the Senators to within a goal of the 2017 Stanley Cup final while playing on an injured foot and ankle. Having so much history with the city, it could be hard for Karlsson to completely move on from Ottawa after just one trip back. “I think we all know this day has been coming up and when it’s going to be and it’s finally here,” he said. “It’s going to be nice that I’m going to be here, I’m going to play here and we’re going to do this and after that it’s probably going to calm down since we’re not coming back for at least another year.